Is 'Supergirl' Setting up a Romance Between James and Lena? “Supergirl” is nominated for a Teen Choice Award for Action TV Show (#ChoiceActionTVShow). Chris Wood (Mon-El) is nominated for a Teen Choice Award for Action TV Actor (#ChoiceActionTVActor). Melissa Benoist (Kara) is nominated for a Teen Choice Award for Action TV Actress (#ChoiceActionTVActress). Vote Now! The show Airs Sunday, August 13, LIVE on FOX. PILOT – Twelve-year-old Kara Zor-El (Melissa Benoist) escaped the doomed planet Krypton with her parents’ help at the same time as the infant Kal-El, her cousin who is known to the world of Earth as Superman. Protected and raised on Earth by her foster family, the Danvers, Kara grew up in the shadow of her foster sister, Alex (Chyler Leigh), and learned to conceal the phenomenal powers she shares with her famous cousin in order to keep her identity a secret. Years later at 24, Kara lives in National City assisting media mogul and fierce taskmaster Cat Grant (Calista Flockhart). She works alongside her friend and IT technician Winn Schott (Jeremy Jordan) and famous photographer James Olsen (Mehcad Brooks), who Grant just hired away from the Daily Planet to serve as her new art director. However, Kara’s days of keeping her talents a secret are over when Hank Henshaw (David Harewood), head of a super-secret agency where her sister also works, enlists her to help them protect the citizens of National City from sinister threats. After 12 years of keeping her powers a secret on Earth, Kara decides to finally embrace her superhuman abilities and be the hero she was always meant to be. The episode was written by Greg Berlanti, Andrew Kreisberg and Ali Adler and directed by Glen Winter (#101). Original CBS airdate 10/26/2015. Let it Happen Trailer Have no fear, your favorite superheroes are all here! New episodes premiere this fall on The CW! KARA’S CONFIDENCE AS A SUPERHERO IS OFF TO A SHAKY START UNTIL A NEW THREAT FORCES HER TO PUSH HER DOUBTS ASIDE – When Kara’s (Melissa Benoist) attempts to help National City don’t go according to plan, she must put aside the doubts that she – and the city’s media – have in order to capture an escapee from the Kryptonian prison, Fort Rozz. Also, Cat (Calista Flockhart) pressures James (Mehcad Brooks) to use his connection to Superman to get her an interview with Supergirl. The episode was written by Greg Berlanti and Andrew Kreisberg and directed by Glen Winter (#102). Original CBS airdate 11/2/2015. Vote for "Supergirl" to be on Entertainment Weekly's Fall Preview issue cover! The show has been renewed but will now air on "The CW!" Videos: Supergirl Is Moving to the CW This Fall! The CW gets even more super when your favorite DC shows return this fall! Special | This Fall on The CW Your favorite shows return to The CW next fall! The Flash is speeding to National City! THE FLASH star Grant Gustin, in his role of Barry Allen/The Flash, will cross over to SUPERGIRL in an episode to be broadcast Monday, March 28 (8:00-9:00 PM, ET/PT) on the CBS Television Network. Details of the episode will be announced at a later date. SUPERGIRL stars Melissa Benoist, Mehcad Brooks, Chyler Leigh and Jeremy Jordan, with David Harewood and Calista Flockhart. The series is produced by Berlanti Productions in association with Warner Bros. Television. Greg Berlanti, Ali Adler, Andrew Kreisberg and Sarah Schechter are the executive producers of SUPERGIRL, based on the characters appearing in DC Comics, and created by Jerry Siegel and Joe Shuster, by special arrangement with the Jerry Siegel Family. THE FLASH, which airs Tuesdays on The CW, is produced by Bonanza Productions Inc. in association with Berlanti Productions and Warner Bros. Television. Greg Berlanti, Andrew Kreisberg, Todd Helbing, Aaron Helbing and Sarah Schechter are the executive producers. Predict the 'Supergirl' premiere ratings: Will it fly high or crash? It’s a bird! It’s a plane! It’s Supergirl! Start the Presses: Where Is Supergirl's Hype Train? CBS FALL PREVIEW, hosted by the Emmy Award and Golden Globe Award-winner Jane Lynch, star of CBS’s new comedy series ANGEL FROM HELL, is a primetime special highlighting the Network’s five new fall series. It will be broadcast Monday, Sept. 7 (8:30-9:00 PM, ET/PT) on the CBS Television Network, and CBS All Access, the Network's digital subscription service. In addition, the special will be available on demand across multiple platforms through Sept. 30, providing viewers with convenient anytime access to information about the Network’s new fall lineup. The platforms include CBS.com (http://www.cbs.com/shows/cbs-fall-previews-2015/), the CBS App ( www.cbs.com/mobile/ ), select CBS Audience Network partner sites and participating CBS stations’ sites, as well as on demand via the Network’s various cable, satellite and telco partners. SUPERGIRL, premiering Monday, Oct. 26 (8:30-9:30 PM, ET/PT) before moving to its regular time period (8:00-9:00 PM) on Monday, Nov. 2, is an action-adventure drama based on the DC Comics character Kara Zor-El (Melissa Benoist), Superman’s (Kal-El) cousin who, after 12 years of keeping her powers a secret on Earth, decides to finally embrace her superhuman abilities and be the hero she was always meant to be. Chyler Leigh, Calista Flockhart, Mehcad Brooks, David Harewood and Jeremy Jordan also star. A special 90-minute original episode of SCORPION, the Network’s hit sophomore show, will lead out of the series premiere of SUPERGIRL, Monday, Oct. 26, on the CBS Television Network. The night will open with an original episode of broadcast television’s #1 entertainment series, THE BIG BANG THEORY (8:00-8:30 PM), followed by SUPERGIRL’s debut (8:30-9:30 PM), and an extended SCORPION (9:30-11:00 PM). As previously announced, SUPERGIRL moves into its regular time period (8:00-9:00 PM) on Monday, Nov. 2, followed by SCORPION (9:00-10:00 PM) and NCIS: LOS ANGELES (10:00-11:00 PM). Also, THE BIG BANG THEORY returns to its regular Thursday time period (8:00-8:30 PM) on Nov. 5, following the conclusion of NFL THURSDAY NIGHT FOOTBALL. 6/24/15 COMIC-CON® 2015 TO FEATURE THE MOST CBS SERIES PANELS EVER! Comic-Con® 2015 will feature the most CBS show panels ever! SUPERGIRL, LIMITLESS, ZOO and EXTANT will make their San Diego debuts, joining popular Comic-Con alums THE BIG BANG THEORY, PERSON OF INTEREST, SCORPION and UNDER THE DOME. The CBS series panels will present first-look videos, including world premiere screenings of the highly anticipated new fall dramas SUPERGIRL and LIMITLESS. Pilot Screening & Panel – This exclusive evening will feature several superhero-themed series, including a pilot screening of CBS’s highly anticipated new action series SUPERGIRL, followed by a Q&A with stars and producers to be announced. In the vast DC Comics Universe of superheroes, the rich mythology of Superman and the planet Krypton is perhaps the most famous and instantly recognizable. Enter Supergirl! Born on the doomed planet Krypton, the preteen Kara escaped at the same time as the infant Kal-El, but didn't arrive on Earth until many years later after being lost in the Phantom Zone. Now at age 24, living in National City and working as an assistant for Catco Worldwide Media mogul Cat Grant (Calista Flockhart), Kara (Melissa Benoist) has spent so many years trying to fit in that she forgot to ever stand out. All that changes when she decides to embrace her superhuman abilities and become the hero she was always destined to be. With the help of Daily Planet photographer James Olsen (Mehcad Brooks), her foster sister Alex (Chyler Leigh), and the research of the super-secret, off-the-grid Department of Extra-Normal Operations (DEO) and its head, Hank Henshaw (David Harewood), who are tasked with keeping the Earth safe from aliens, Kara takes to the skies to protect her world. From Berlanti Productions in association with Warner Bros. Television, and based on the characters from DC Comics, SUPERGIRL premieres Monday, Oct. 26. **A SUPERGIRL signing will take place on Saturday at the Warner Bros. booth (#4545). Signing time to be announced. For additional information on Warner Bros. Television’s plans for Comic-Con and for real-time updates during the convention, please follow WBTV on Twitter @warnerbrostv – official hashtag #WBSDCC – and visit http://comiccon.thewbcom. CBS today unveiled its 2015-2016 primetime lineup, featuring seven new shows and 22 returning series. CBS will build on a schedule that will finish the current season as America’s most-watched network in viewers for the 12th time in 13 years, including the last seven years straight. 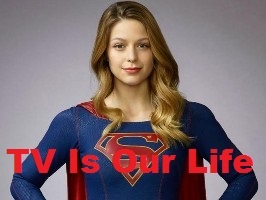 The new fall dramas are ... and SUPERGIRL, starring Melissa Benoist in the title role based on the DC Comics superhero. When THE BIG BANG THEORY and LIFE IN PIECES move to their regular Thursday time periods after football, the new action-adventure drama SUPERGIRL will open Monday at 8:00 PM. Visit our Primetime Forum for more Supergirl news! Check out our Supergirl Spoilers Page!